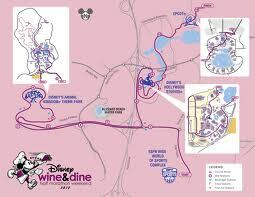 You are here: Home / Find the Time / 2014 Wine and Dine Recap! When I set my goal to run Wine and Dine I had never run a full mile. I was not a runner period. I have a lot of health issues to over come on a daily basis and my whole family thought I had completely lost my mind. 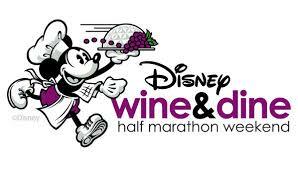 Fast forward a whole bunch of training miles, IV treatments and doctors appointments and here I am Running the Disney Wine and Dine Half Marathon with my son Taylor. Our costumes turned out great! 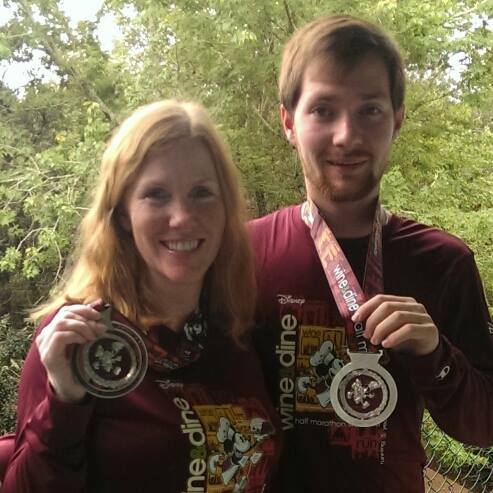 I wanted to wear something runner friendly for our first 13.1 race but still have Disney spirit. 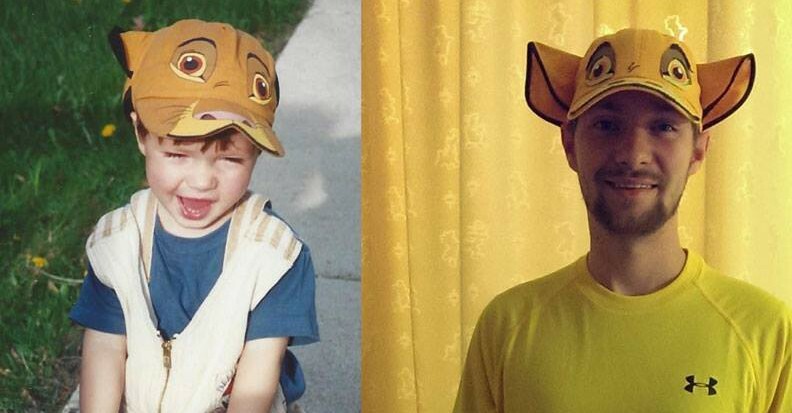 Taylor loves lion king and had this great hat when he was little of Simba. I used a picture of it to create some adult sized versions of Simba and his mom Sarabi. 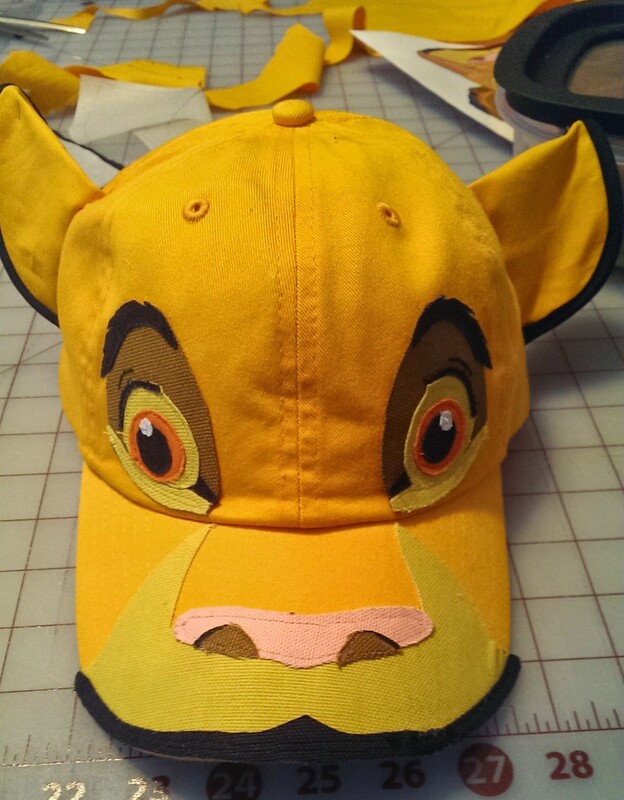 I found a hat at Lids that was about the same color then traced out each piece of the eyes and made applique using fabric that I found of the same color and texture at Joann’s. This was my first applique experience but i’m happy with the end result! The ears I made and sewed on to the hat. All markings were hand drawn. Sarabi’s had a little more eyelashes and eye shadowy look. Overall I thought they were a close second to his original hat. Leading up to the race the furthest I had gone in my training was 11 miles. I was having problems with my knee and my doc told me to ease back a bit but keep training. All I could do is hope it was enough and my adrenaline would take me the remainder miles. We arrived Wednesday night and Taylor and I were so excited! I really was feeling good and knew how to tape up my knee if necessary, had a plan and new compression socks. What could go wrong? We hit the Expo Thursday and Sat morning and spent the remaining time in the parks. The Expo was full of excited runners and it was just wonderful. I did quite a bit of damage there but really loved everything I got. Here is a pic of some of my finds. Taylor and I also splurged on a tens unit for each of us as we both have Fibromyalgia and I have Lupus in addition – it seemed like a no brainer. We used it every night after our times in the park and it really helped our muscles relax. As the weather report became clearer and clearer – it looked like we were in for a cold wet race. Luckily I had brought capri pants and a long sleeve tech shirt to go under my yellow sarabi shirt just in case but both of us were not very happy with the prospects of running 13.1 miles in a cold rain. 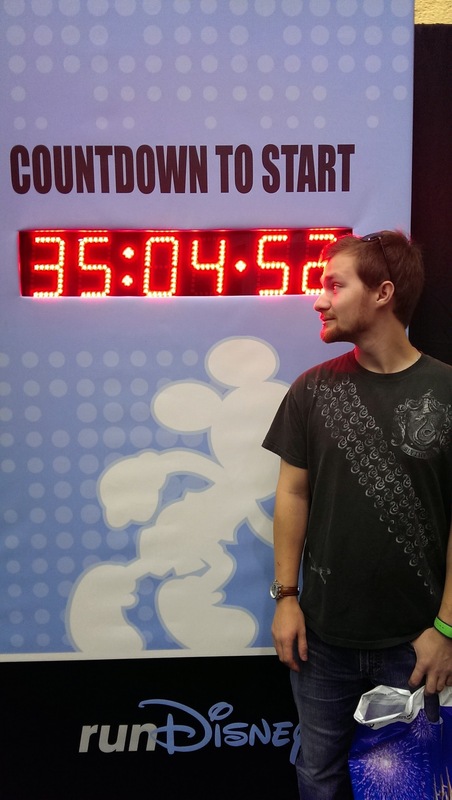 Fast forward to the day of the race we came back after being in the Magic kingdom that morning and then the expo to take a nap. I think I slept only one hour and the whole time I was worried about not waking up on time so it was not very restful. My adrenaline was rushing and I was nervous about the night. 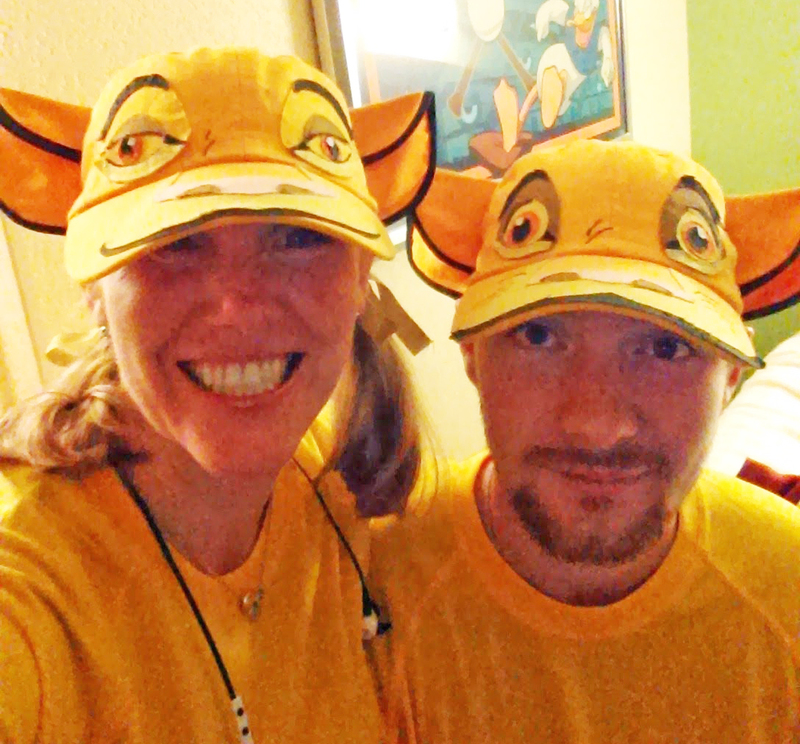 Taylor and I got all ready in our costumes and headed to the buses. I wanted to get there with a little time to spare to check out the pre-race party and just take a breath. It was so much fun – they had a great party atmosphere as people started coming in we really enjoyed seeing everyone’s costumes. There are some seriously creative people out there. 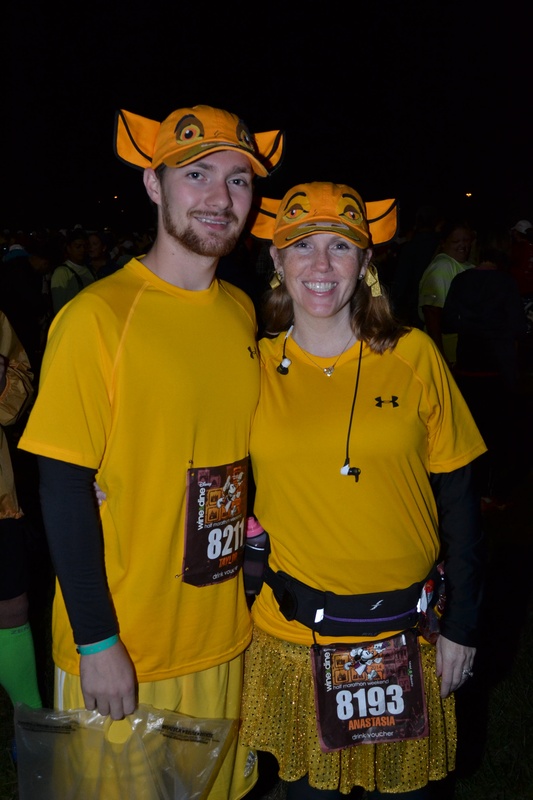 We got a lot of compliments on our Simba and Sarabi hats and people were all as excited as we were making it even more exciting. As the time started to near we had a potty break and headed for our corral. 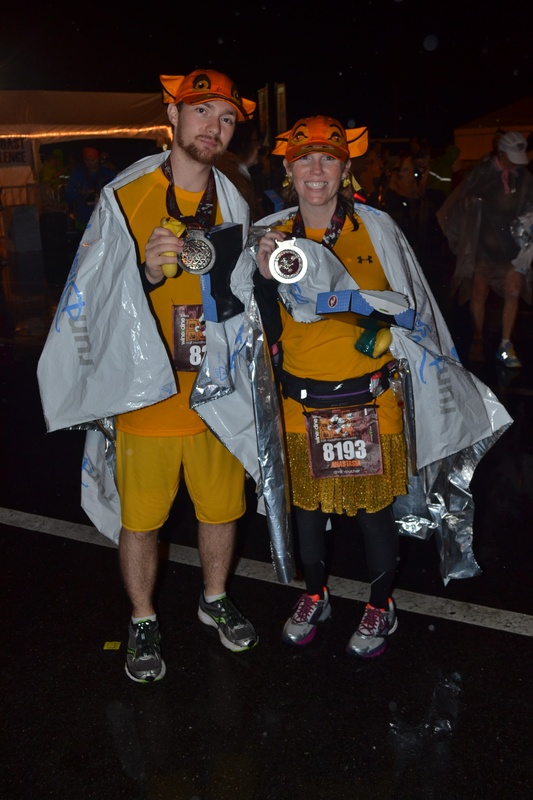 Our strategy was to get ahead early because 1 we were already feeling a little achy given the light drizzle that started before the race which made us both a little apprehensive, and 2 we knew the longer we ran – the more sore we would be. We both started off great at a nice pace. There weren’t as many photo stops I heard later because of the rain of the night but we knew that if we stopped we be more at risk to see the balloon ladies. I totally did not want to see those ladies tonight I wanted to have a great run with Taylor and finish on my feet. We kept our pace running 2 min walking 1 for the majority of the race. As we were going along we knew we were making great progress. My Runkeeper told me we were below our normal pace and we both felt great. The road to Animal kingdom seemed so long. It hadn’t started really down pouring yet but we were wet. There were numerous waterlogged tutu’s lining the side of the road now as we ran along and I was really glad for our first time that I opted for a minimalist costume. 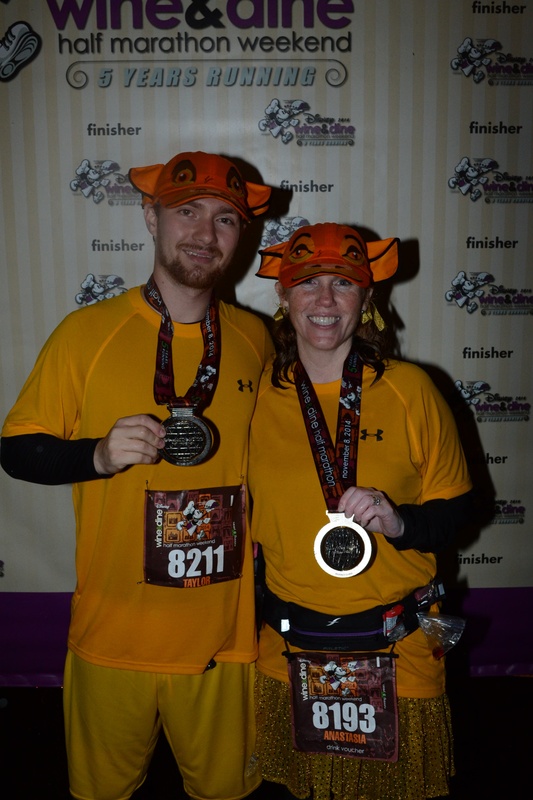 As we got closer to Animal kingdom we saw the elite runners coming the other way. I was totally blown away at how fast they must have been running. Everyone would cheer for them when we saw them coming on the other side of the freeway. Both Taylor and I were like – wow there must be a turn ahead but we were wrong – it was the Animal Kingdom. I was so excited to get to our first park! The roads and walkways were really slick and Disney personnel were there along the route cautioning us as various points. The one thing I will say about Animal kingdom is there are a couple of very crowded points where you just have to walk. It gets so narrow and everyone is trying to get thru that it just slows down. However, once we were in things started to pick up again. I was exceptionally grateful that the bathrooms were open. I am not a portapotty fan and took an opportunity for a quick pit stop. Taylor and I were doing great and were smiling non stop as we made our way around the tree and thru Animal kingdom. Once we got back out to the road it was we were very wet. It had started raining pretty good now but I wasn’t as cold as I thought I would be. As long as we kept running I felt like I would be good. Just before Hollywood Studios Taylor started hurting in his knee. We stopped at one of the medical stations along the way and both put some biofreeze on our knees. Ok this was my first time trying biofreeze and it was a miracle cream. Lol I love love love biofreeze now. Seriously, it was such a relief we stopped again to get more. Surprisingly I was sore but I was ready and felt great. I kept Taylor going because I knew we were in for a big treat as soon as we got into Hollywood studios. There are two parts of this race that I had read about that were just awesome. The Osborne lights and that portion of the backlot tour that you typically go through on tram to see the behind the scenes costuming departments. We were a little slower but were still doing really well then we got to the backlot tour area. The whole tunnel was total disco balls lights and awesome music. Everyone slowed down a bit to really appreciate it and most of us (Taylor and I included) danced and strutted our way on through it. It was a huge boost right when we needed it. I was like – just wait Taylor – a great part is just around the corner. We kept on running and ran right into the Osbourne lights. 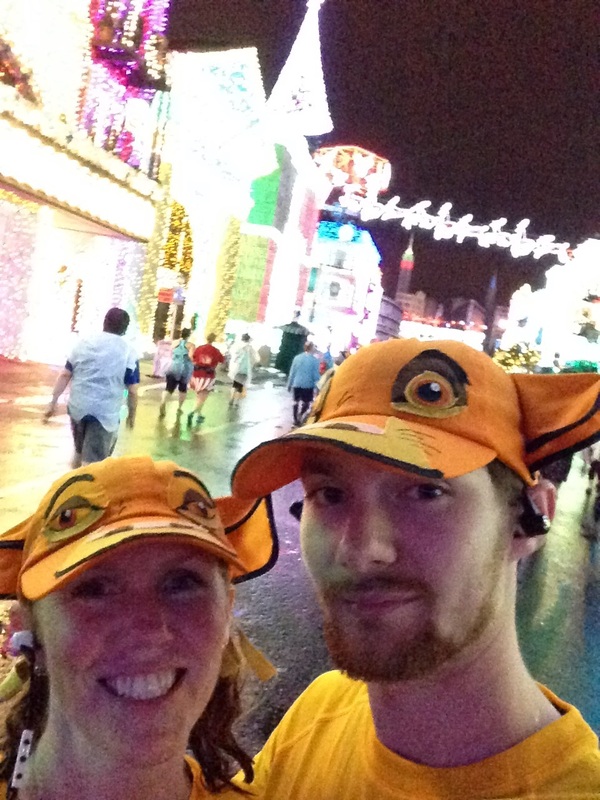 Well – as it was the first time we had seen them AND we were so far into our race we both were just mesmerized! We even stopped for a selfie! Everyone was looking around taking pictures. It was just magical. After our short pause we knew we were in the home stretch. Mile 11 on our way out and we knew it was just a few more to go! We were definitely feeling it and were starting to feel a little colder. We kept each other going and were still smiling though as we made our way to Epcot. The people all along the way, the volunteers, everyone was so encouraging and amazing. We took a good look behind us at this point to see if any balloon ladies were in sight and all we could see for miles were runners just like us. The boardwalk area leading to Epcot was really slick. We definitely slowed down as did many others during this part. A fall for me on this course would have been the end of us. We passed the last busses for injured or slow passengers and knew we were in the clear. It was an exceptional feeling. We were really cold toward the end and were just walking it out trying to walk fast. 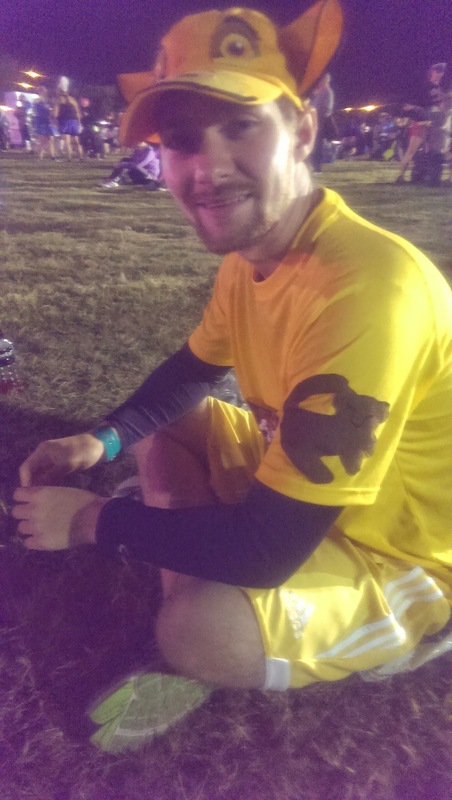 Taylor’s knee was really hurting him and I was starting to feel some muscle tightness as I was getting colder. 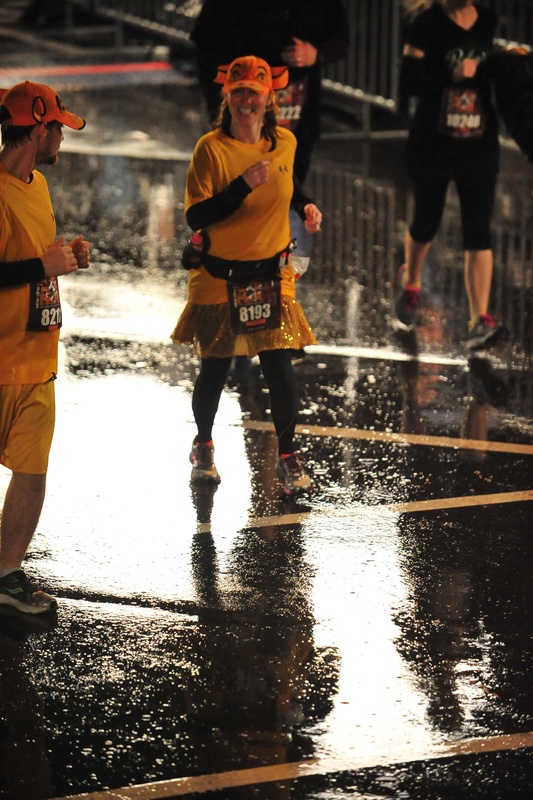 As we neared the finish line there was Kam and Ethan standing in the rain cheering us on. Seeing them there was just what we needed to finish. As we were getting towards the finish line both of us decided we weren’t going to walk over the finish. We ran. It was an amazing feeling finishing as strong as we did. We both were shaking from the cold and got our medals, snack boxes and those blankets they give you. Taylor was heading for the exit but I was like – hold up! We need to stop for our pictures!!! We found Kam and Ethan and headed into Epcot for a warm bathroom to put on some dry clothes and get some food! We got a quick bite to eat and headed back. I was so cold until we got back showered up and got into bed. What an amazing night! We actually got up next day and were in the parks again before lunch. We were sore but walking around did us a lot of good. I think this race would have been even more fun if the weather hadn’t been so crappy. 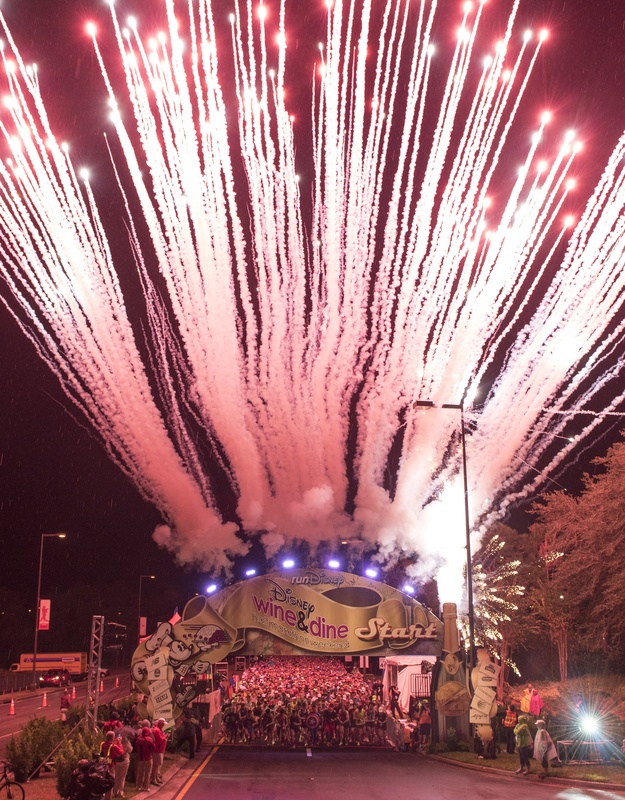 Many of our RunDisney friends were calling it the splash and dash and they were dead on. We were soaked to the bone when we were done. I loved that this race was at night! I’d much rather run late than early. I think we will have to do this one again sometime. I want to thank all of those great friends who donated on my Lupus fundraiser page and those friends who helped me maintain momentum when training was tough. Everyone was so supportive of us on this journey. Taylor and I left this great week thinking – what is our next BIG challenge!! !